Windows 8 full version rls aayo? Lock Screen - The new lock screen for Windows 8, which appears after you put your computer to sleep or restart or lock your computer. Notifications such as new email alerts, Wi-Fi availability and other essential, user-chosen information will be pushed to this screen. 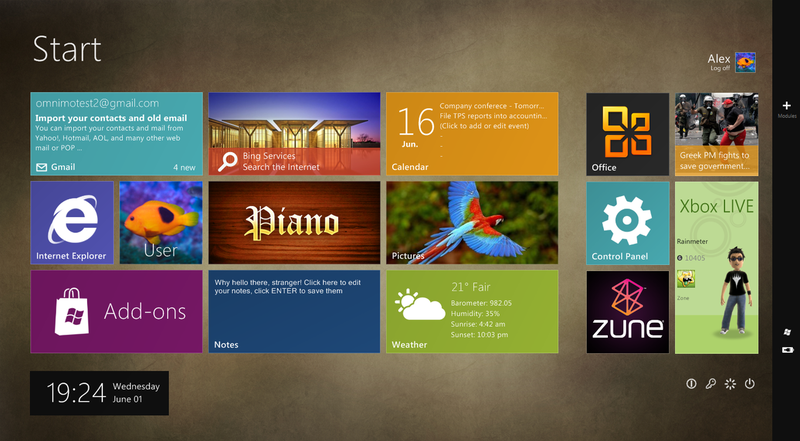 Start Screen - Here is the start screen in the ‘Metro’ view (the classic start bar “desktop” view is still available). Users can scroll side-to-side, much as they would on an iOS or Android phone, for different groups of applications. Immediately to the right of this homescreen is the media hub. Grouped Apps - Users have the option to categorize their apps into genre or function. Sinofsky and Green showed off a Media category, Games category and social networking category. Zoomed Out View - Users can zoom out from this view to see all of their apps at once. This is also where you can move entire blocks at a time closer to the homescreen. For example, if you want Games immediately next to your homescreen, or on the homescreen itself, you can pick up the entire block and drag it to the left. On Screen Keyboard - Emphasizing touchability, a demo of the Windows 8′s on-screen keyboard was shown to pop up with the scroll of the thumb. The new Microsoft OS still works, of course, with mouse and physical keyboard, but this is an option for those on tablets or touchscreen PCs. RSS Feed - An RSS reader in Metro view–very scrollable and visual. RSS Feed – Expanded - An expanded view of the RSS feed. Users can scroll up and down within articles or left and right to switch between articles. Social Network - A view of a hypothetical social network, in a pane interface. You can see the news feed pane on the left and the full view on the right. Video Player And Settings - While playing a video of paragliding, Julie Larson-Green turned up the volume via in the collapsible sidebar settings panel. Multi-Tasking – News Feed And Video - You can view two apps or windows at once on your tablet by dragging them together and letting them “snap” together. Seen above, a scannable News Feed flanks a paragliding video, letting the viewer work while enjoying media entertainment. Newly Opened Tab In Internet Explorer - Starting up Internet Explorer in Metro mode. Here you can see the Most Visited pages and Favorites pinned to the page. Internet Explorer With On-Screen Keyboard - Typing a web address into Internet Explorer using the on-screen explorer. The ‘Share Charm’ - The ‘Share Charm’ icon sits on the Start bar. When you see something within an app you want to share, pull out the start bar and click ‘Share”. Select a piece of text, image, video or whole webpage and choose a contact in your address book you want to send that information to. Universal Spell Check - Green didn’t mean to, but she showed off another new feature of Windows 8 (also recently added to Lion OS X): Universal Spell Check, which proofs words typed in any Windows 8 app. Universal Search - Speaking of Mac, Windows 8 will have a spotlight-style universal search, which will let the user browse through the entire system for a search query. The search bar can also scan through any of your apps, including apps like Bing that search online. So,anyone tried out consumer preview yet ?? i thought of downloading it. But the size is too big. Limited Download option in broadband.